The picture shows an example of profile drawing. The red line corresponds to the reference surface. Notice that the upper plot (named IH) have been reversed in order to show to the left the point I, as it happends in the plan. 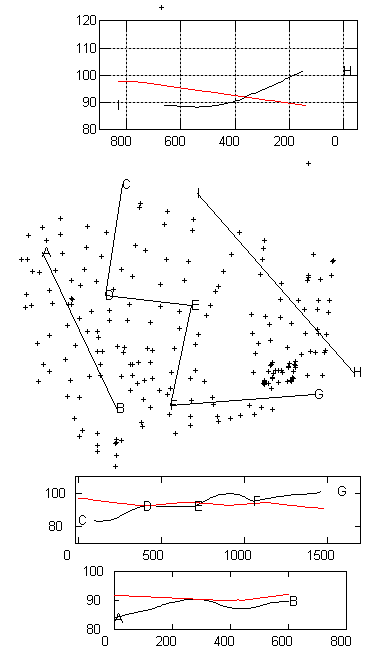 Another point to illustrate here is that both I and H are external to the convex polygon of the elevation data. However, the red line goes up to I but not to H, because the Reference Surface covers a larger area than the elevation data. EasyDEM also handles profiles with broken lines, as is illustrated in CDEFG. The letter sequence is automatically generated, but could be modified by the user. In any case, it is still coordinated with the elements in the drawing area.